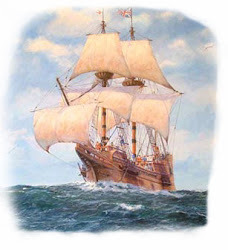 Mayflower Brothers: Who is to Blame for the Social Security Ponzi Scheme? American Voters! Who is to Blame for the Social Security Ponzi Scheme? American Voters! There is a lot of blame flying around for the growing financial problems of our social security system. Let's leave the Constitutional argument out of this discussion and just cover the blame game. The answer to who is to blame is very simple, we all are. Every voter in the US for the last 75 years is responsible for the problems we are now facing. The problem is simple. Social Security uses payroll taxes to buy Treasury bonds. The Treasury puts the money from the bonds into the general fund and uses the money to operate the government. So we've been living on our social security money for years. And now that payroll taxes don't cover all the money going out in Social Security benefits, the system is underwater. They have to collect on the bonds which means the government has to use money from other collections to pay back the bonds they sold and that is where the problem comes in. Social Security if just one big Ponzi Scheme. Take from new investors (our young people) to pay returns to older investors (social security recipients). Ponzi Schemes are illegal everywhere except when the government is involved. So now that Social Security needs its money back, where does that money come from? The US Government has almost a $15 Trillion deficit, going into over $1.5 Trillion in debt just this year. So now the government has to not only find the Trillions of dollars for the regular budget but they have to find additional money to pay for Social Security benefits. So whose fault is it? Every US voter. Economists have known since Social Security started that eventually the system would go upside down. I can remember discussions on Social Security when I was in high school 20 years ago that this would eventually be a problem. So why didn't we do anything about it? Greed. No one wanted to give up the things they were getting to plan for the future. It's the same problem Americans have had with everything else. No one wants to practice delayed gratification, it's all about "I'm getting mine". So the next time you think about telling someone that you paid into Social Security so you deserve to get yours, remember that you've been allowing the government to live on your social security money for the last 75 years. That's like borrowing against your 401K and then going back and expecting to be able to take the money out. Maybe you should have considered that you might need your Social Security benefits before you let your government spend all your money. The money isn't there any more. Future generations shouldn't be leveraged to pay for the mistakes of their elders. The Social Security Ponzi Scheme needs to stop. But no one has the guts to stop it!